1 Preheat the oven to 180°C (160° fan) | 350F | gas 4. Lightly grease and flour the tins. 2 Mix the flour and baking powder. Whisk the sour cream with the sugar, butter, orange juice and salt. Beat in the eggs. Quickly stir in the flour and baking powder. 3 Spoon the mixture into the tins and bake in the oven for 20-25 minutes. 4 Take out of the oven, leave to rest for 5 minutes then take out of the tins and cool on a cake rack. 5 For the cream, soak the gelatine. Take 50 ml of the redcurrant juice and heat in a pan with the thyme, but do not let it boil. Infuse the thyme in the juice for 10 minutes, then take out and dissolve the gelatine in the juice. 6 Stir the gelatine mixture into the rest of the cold juice and chill. As soon as it begins to set around the edge of the container, whip the cream stiffly and fold into the setting redcurrant juice. 7 Spoon the cream into a piping bag fitted with a large plain nozzle. Pipe a spiral on top of each bun. 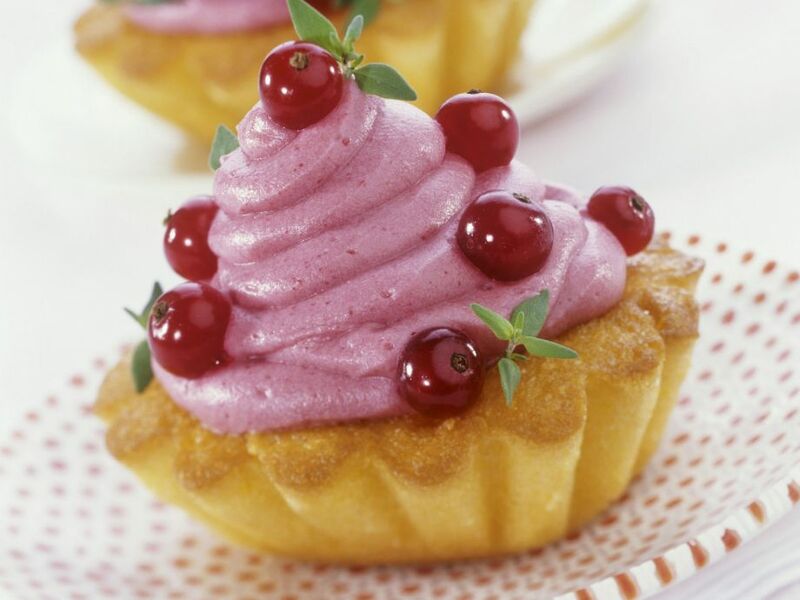 Decorate with fresh redcurrants and thyme leaves. Serve immediately.